Editor’s Note: We had so much material for the History Mysteries theme that we weren’t able to include everything in both issues. Rather than go to three History Mystery issues, we decided to post several articles here on the website. Be sure and read Catherine Aird’s article on Richard III and Jim Doherty’s “Long-Ago Lawmen” with his lists of favorite historical police procedurals. Fans of the Children’s Hour will especially enjoy a double helping from Gay Kinman. The attached PDF can be printed and added to your Mystery Readers Journal collection. If you use legal paper, there’s a way of printing it using only 8 pages/front back. 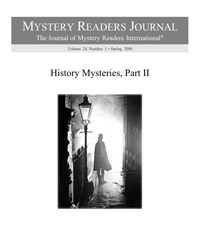 History Mysteries II Supplements: PDF Supplement: This one is the straight format, pages in order, readable online or on your computer, or printable page-by-page. PDF Supplement, Book Format: This file is for printing out a booklet that you can staple together and put on your shelf with your Journals. You will need to use legal-size paper (8.5 x 14″). Print the odd pages first, then flip the stack over and print the even pages in reverse order on the backs of the odd pages. You can make these selections in the Acrobat printing window. (When you print the first set, be sure to observe whether the head of the page comes out on the left or the right, and feed the pages correctly for the second printing.) Fold the stack down the middle and the pages should come out in the correct order. Lately, I’ve started to think I should have a bar of soap in my mouth while I’m writing. Not that I find the taste of Irish Spring so inspiring. It’s just that so many readers seem to think I have a potty mouth. There’s a fair amount of swearing, yes, but it’s all of the PG-13 variety. Most of it you could hear on network television just about any night. In fact, it’s the kind of salty talk that would’ve been cut from the typical Deadwood script because it wasn’t nasty enough. Yet more than one reader has asked me about the “language” in my books. The Mystery Guild slapped my first novel with a “Naughty Words Advisory” (or something like that) in one of its catalogs. And the one and only bad review I’ve ever received (so far) complained about all the cursing my heroes do. And yet you’ll find more profanity in one chapter of Elmore Leonard than you will in an entire book of mine. I don’t get it. Or I didn’t get it. But now I think I do. Here’s the problem: I write historical mysteries. But my books are a long way from L.A. Confidential. I don’t just write historical crime novels. My books—Holmes on the Range, On the Wrong Track and The Black Dove—are fair-play whodunits with Sherlockian overtones. Oh, and the good guys are a couple of 19th century cowboys. Sherlock Holmes fans are not used to swearing. Agatha Christie fans are not used to swearing. And Western fans—at least the ones whose vision of the West was shaped by Gunsmoke and Roy Rogers—are not used to swearing. This epiphany came to me when I was talking to a book club recently. The members had just read Holmes on the Range—God bless them, every one!—and they had a lot of questions about my gritty depiction of life on an 1890s cattle ranch. While I was droning on in my usual way about the value I place on verisimilitude and how I want to portray the West in a way that isn’t sanitized or homogenized and blah blah blah, it finally dawned on me what a potentially upsetting thing I’d actually done. Because a lot of folks don’t just think they already know “the Wild West” — thanks to Red River and The Lone Ranger and Bonanza etc. etc., they almost feel like they were actually there. And I’m telling them they weren’t. The Ponderosa Ranch? Where the Cartwrights lived? It would have been muddy and dangerous and most of the time it would’ve stunk to high heaven and it would have turned your stomach to see how they really treated poor Hop Sing. In other words, I’m messing with a beautiful dream. Like if someone told you Mr. and Mrs. Claus really do live at the North Pole… only they’re getting divorced because of Santa’s thing for elves. So now that I know (I think) why some people seem surprised by the relatively mild profanity in my novels, what should I do about it? It’s hard to say. I’m three books into a series, and it’s too late to have the heroes switch to interjections like “by cracky” and “dad-blasted” now. I’ve begun painting a portrait of a time and place that I want to feel real. The palette’s in place—and, yes, colorful language is part of the picture. Should I swear off swearing? Steve Hockensmith’s Holmes on the Range was a finalist for the Edgar, Anthony and Shamus Awards for Best First Novel. The third book in the “Holmes on the Range” series, The Black Dove, was released in February by St. Martin’s Minotaur. More of Hockensmith’s blah blah blah can be found online at stevehockensmith.com. The Iron Horse (2007) is the fourth book in my series about Inspector Robert Colbeck, a Victorian detective who specialises in crimes on the railways. The novel begins at Crewe, an archetypal English railway town, where a porter drops a heavy trunk from the roof of a train and splits open a hatbox. Out of the hatbox, rolling across the platform, comes a human head. Send for Colbeck. Though the railway detective doesn’t realise it at the time, the decapitation is related to the running of the Derby, the premier flat race in Britain. Colbeck and his assistant, Sergeant Victor Leeming, have to follow a tortuous trail that leads them to Ireland and back into some of the murkiest parts of London. The climax of the book is at the Derby itself, the main race in a carnival that celebrates a national holiday. Hundreds of thousands of people converge on Epsom Downs to enjoy the event. The highest of peers and the lowest of criminals rub shoulders in this jamboree. The vast crowds do not make Colbeck’s job any easier. He knows that certain owners will—literally—kill to win the Derby so he has to keep a number of suspects under observation. Only when the race is run and there is a surprise result can he solve the mystery of the head in the hatbox. Along the way, he has had to deal with all levels of soci-ety and all manner of associated crimes. His success is based largely on his ability to move around quickly by means of the iron horse. Railways were the defining phenomenon of the Victorian age. They transformed people’s lives, making it possible for them to travel to all parts of the country. In 1854—the date of The Iron Horse—only three towns in the whole of England lacked a railway station. Ten years earlier, a Temperance fanatic organised an excursion train from one part of Leicestershire to another. It was such a successful event that he decided to lay on regular excursions. His name was Thomas Cook and he’s still synonymous with our tourist industry. I come from a railway family and have always wanted to write a series about the age of steam. My father and my uncle were both engine drivers and other members of the wider family were employed on the Iron Way. I was only a small boy when I was sneaked onto the footplate of a steam locomotive and taught how to shunt. It was an exhilarating experience and roused the Casey Jones in me. Like most writers, I take great care over the choice of name for my protagonists. I picked “Colbeck” because it was short, unusual and only appeared once in the Dictionary of National Biography. Soon after the first book in the series came out—The Railway Detective—I was watching the TV news and there was an item about a murder in Nottinghamshire. The police spokesman who suddenly popped up on the screen was—yes, you’ve guessed it—Inspector Robert Colbeck. I just hope he solves his crimes as regularly as his namesake. Having written over fifty mysteries as Edward Marston, Keith Miles or Conrad Allen, I decided to ring the changes by writing an adventure story with strong mystery elements. Soldier of Fortune (January 2008) is set during the War of the Spanish Succession, one of the great military events that helped to reshape the map of Europe. The big advantage of writing about war is that you always have set-piece battles. There are three in Soldier of Fortune—the battle of Sedgemoor in 1685, the storming of the Schellenberg and the battle of Blenheim, both in 1704. My hero has ample opportunity for heroics. Captain Daniel Rawson is only a boy in 1685 when Sedgemoor was fought. He looks after their farm while his father joins the Monmouth Rebellion that tried to depose King James II. The Duke of Monmouth was the eldest son of Charles II, claiming the throne on the grounds that he was not illegitimate but the child of a secret marriage between Charles and his Welsh mistress, Lucy Walter. The rebellion failed dismally. The young Daniel Rawson has to watch his father being hanged alongside many other rebel prisoners. Almost twenty years later, Rawson is a soldier, spy, linguist and ladies’ man. He finds that the best way to learn the enemy’s plans is to seduce the wife of one of the French generals. From then on, he’s a marked man. His commander is the Duke of Marlborough, who helped to lead the royal forces at Sedgemoor. He and Rawson are now on the same side and there’s nobody whom Marlborough trusts more for special assignments. Because Rawson’s mother was Dutch, he spent his formative years in Amsterdam and speaks fluent Dutch, German and French, a tremendous asset in the bedroom and out of it. The battle of Blenheim changed the course of history and the mighty French army was at last humbled. It was fascinating to explore the period through the eyes of a fictional character. Like the protagonists of my mystery novels, Daniel Rawson has to be something of a detective in order to stay alive. My next mystery—Murder on the Brighton Express (2008)—brings Inspector Colbeck back into action and there’s a military angle this time. An express train is involved in a collision with another locomotive and several passengers are killed. The Inspector General of Railways was always chosen from the Royal Engineers so Colbeck finds himself crossing swords with Captain Harvey Ridgeon, a man who is used to unquestioning obedience. Ridgeon believes the disaster was caused by driver error. Colbeck is certain that someone delib-erately engineered the crash. The sparks fly. In the search for evidence, Colbeck has to delve into the world of politics, railway finance and religion. Brighton in 1854 was a thriving seaside town that attracted thousands of visitors from London. A horrendous crash is bad publicity. Colbeck is under great pressure to solve the crime so that everything can get back to normal. The problem is that one crime generates others and the inspector is soon fighting on many fronts. Find out how he gets on. The Iron Horse, Soldier of Fortune, Murder on the Brighton Express are all published in England by Allison and Busby but available in the States through International Publishers Marketing (IPM). Edward Marston is the author of over forty crime novels, set in four different historical periods. He also writes as Edwardian mysteries as Conrad Allen and contemporary crime as Keith Miles. See edwardmarston.com. Now it can be told: my hero, Gordianus the Finder, sleuth of ancient Rome, is not dead. He’ll be back this May in the new novel in the Roma Sub Rosa series, The Triumph of Caesar. Here’s what happened. As I was writing Judgment, I had already started my research on a big project outside the Gordianus series that would take me at least a couple of years to write (Roma, my novel about the first thousand years of the Eternal City). I also knew that the next scheduled volume with Gordianus would be a collection of short stories, which take place early in his career. So I wanted to put the series in a sort of holding pattern for a while, knowing the next Gordianus novel would be at least four years away. Knowing I’d be saying farewell to Gordianus for a while, and drawing near the end of Judgment, I began to see a way to put my hero on hold. The precise twist came to me, as it often does, even as I arrived at that point in the narrative; sometimes these things seem to work subconsciously, and are ready to go only as I hit the space-bar and begin to write that final chapter of a novel. The scene: Gordianus, having been separated for months from his wife, Bethesda, returns to the place where he last saw her, at a temple on the Nile. He seeks her in the water, has an otherworldly experience of merging with the eternal Nile, and finds himself on the riverbank with Bethesda beside him. Many readers were left thinking that the Finder and his wife were no longer in this world. Oh boy, did I get e-mails! Some readers “got” what I’d done and said they were impatient for the next novel, but many expressed regret at the “end” of the series (though some thought Gordianus might return as a ghost). Spouses and members of reading groups differed on whether Gordianus was alive or dead and asked me to settle the question. To any reader who took the trouble to contact me, I didn’t play it coy, but forthrightly explained my decision to end the novel on an ambiguous note, with every intention to continue the saga of Gordianus. I was touched that so many readers expressed sorrow or anxiety over a character I created. But now that Gordianus is on his way back, alive and kicking, I have another confession: a part of me felt at peace at having possibly killed Gordianus off. You see, I am now in my fifties, and although I’m in the best of health (knock on wood), I’ve begun to see intimations of mortality—my mortality, not that of Gordianus, who now seems to stand a good chance to outlive his creator. A man in his fifties may keep living, and writing, for another twenty or thirty years. Or… he could drop dead tomorrow. (The heart attack on the running trail would be my preferred exit.) I felt comforted that, should something happen to me, I had left Gordianus and his beloved Bethesda in a metaphysical holding pattern, perhaps alive, perhaps not. If for any untoward reason The Judgment of Caesar had been the last novel of the series, it would have served as a fitting end-point.